Being a new mom is hard enough but when you see your baby consistently uncomfortable it can become overwhelming. Sage started having silent reflux a couple of weeks after he was born. Silent reflux is common in infants because their sphincters are undeveloped, they have a shorter esophagus, and they lie down much of the time. The symptoms are a bit different from gastroesophageal reflux disease (GERD). Sage wasn’t having any trouble gaining weight. On the contrary, he was gaining twice the amount as the average newborn. His symptoms were painful refluxing (although he didn’t spit up you could see it come up into his throat), noisy breathing (sounded like he need to clear his throat), and trouble feeding (he would often choke). He also would reflux in his sleep, choke, and then wake up unable to breathe well. As a new mom of a newborn there is a certain level of hypervigilance. 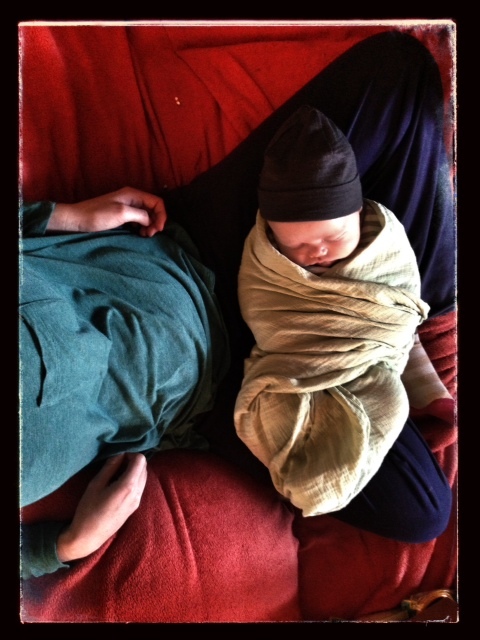 Baby Sage was so new and delicate sometimes I feared he may just stop breathing in his sleep. So when the reflux started and I could hear him actually choking, my nerves sky rocketed. I became obsessed with finding out a way to help correct this issue. Now many people told me that he would just grow out of it but when you feel like your baby is choking every night, letting time take its course seems out of the question. My first pediatrician wrote me a prescription for Zantac. I left that appointment telling my partner there was no way in hell we were about to give our 4 week old baby Zantac. I proceeded to look for alternatives. I tried gripe water, pediatric Tuina, restricted my diet, stopped taking any supplements/herbal formulas, and a cranio sacral treatment. At some point I surrendered into the fact that Sage was fussy and this was what was going on for him. But it was completely draining me. He constantly wanted to nurse. The reflux would burn him. He’d want to nurse to soothe but the excessive eating was just causing more reflux. Over my Christmas break we went to my mom’s house. She’s a neo-natal nurse practitioner. She told me that what he was experiencing was abnormal, dangerous, and was causing him a lot of pain. After hearing this, I became more concerned for my baby. I was more aware of his discomfort. I took him to a pediatrician there who again suggested Zantac and Prilosec. After 3 days of obsessing about whether or not to give these drugs to Sage, I agreed to trying them for 2 weeks. He would take 3 days of Zantac followed by 2 weeks of Prilosec. I felt very uncomfortable with my decision but then again was exhausted by waking consistently in the night to Sage choking and having to pick him up so he could breathe. The drugs did their job. Sage became a very happy baby. He began to spit up but with no discomfort. He also began to sleep for a little bit longer at night. The way that these drugs work is that they reduce the acid in the stomach so that when the baby does reflux it doesn’t burn or cause damage. Once they have been refluxing for a while it actually causes inflammation in the esophagus and that’s what is so painful. Doctors warn that after prolonged inflammation there can actually be permanent damage in the form of scar tissue. Although Sage did seem to have some improvement and I didn’t want him to have any permanent damage, I knew deep down that this was not the solution for us. Once we were back home in Santa Fe I felt comfortable trying an alternative route again. Over the course of the two weeks on the meds, Sage was a happy guy but his reflux continued to worsen with the grand finale of an episode of projectile vomiting. Once off the meds, I got cranky Sage again. I mean who wouldn’t be cranky when they were in pain every time they ate. At the time I was feeding him every time he got upset. I did a bunch of research and found out that this wasn’t helping the situation. I also found out that I had overactive let down. This was causing him to choke and swallow too much air. I began to lay down when I nursed him so that he would have more control over the amount of milk he was getting. I also began a feeding schedule for him. It takes babies about 2 hours to digest a feeding, so I fed him every two + hours. We began to see improvement. We also started keeping him upright 20 minutes after feeding him and making sure we always got a good burp out of him. I had been referred to a osteopath in town and we took him to three appointments. We found out that Sage had some birth trauma. Although his birth had no complications, turns out no one really gets through the experience without a little trauma. If you really think about the process it makes sense. So the osteopath helped release his diaphragm, lengthen the front of his neck, and a bunch of other stuff that I don’t fully understand. Now Sage is a happy guy. He still spits up a couple of times a day but with no discomfort. He also is sleeping 8-11 hours per night. I just wanted to tell any parents that are dealing with a baby with reflux that it is possible to treat it without the medications but it just might take some trial and error.